Studio Technologies Expands Global Presence with Experienced Sales Consultant - Studio Technologies, Inc.
SKOKIE, IL, 13 JUNE 2018 – Studio Technologies, manufacturer of high-quality audio, video, and fiber-optic solutions, announces Mark Townsend has joined the company as a sales representative for the UK and Europe. With over 30 years of experience working for prominent professional electronics companies, Townsend has developed strong relationships in the industry. He is based in the UK and will focus on introducing Studio Technologies’ tailored, high-performance technology to key players in the European pro audio and broadcast markets. 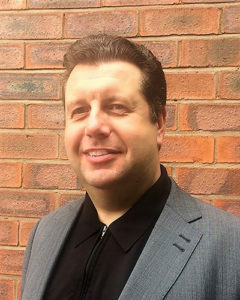 Mark Townsend has joined Studio Technologies as a sales representative for the UK and Europe. After graduating from The University of Hull in 1985 with a degree in applied physics, Townsend began his career as a design engineer for Johnson Matthey, a global specialty chemicals and sustainable technologies company. Townsend held several different roles during his 13-year tenure with Johnson Matthey, eventually being promoted to sales manager of the company’s Matthey Electronics division. He would go on to manage international sales for broadcast technology manufacturer Quartz Electronics for nearly eight years, primarily expanding export sales and developing a distribution network in Europe, Africa, and the Middle East. Since 2006, Townsend has provided sales and technical services to various broadcast technology manufacturers and distributors as an independent consultant.